All cleaning is done by us in our own 2,800 sq ft Palm Desert cleaning facility. Check out some of our impressive before and after pictures in our gallery! • Thorough rinsing until all water runs clean of soil & cleaning products. • When dry we vacuum and groom the rugs and fringe. It takes 3 weavers working 10 hours a day, 6 days a week for 14 months to weave a 9 X 12 Rug. Nice rugs can have a value of $30 to $150 or more per sq. ft. Is it not worth it to clean them properly? Here’s what you need to know, The Importance of Proper Rug Cleaning. Full water submersion is the Traditional Old World way to properly clean Hand Made Rugs. Quality Rugs are not supposed to be truck mount cleaned. 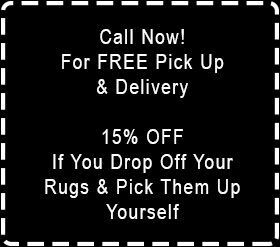 Many carpet cleaners offer rug cleaning but they do not provide the same service as Magic Rug Cleaners. At our shop, every rug is 1st inspected for existing or potential damage, dye stability, how the rug is made & what fiber the rug is made of. You can’t clean a rug properly without knowing all these things. Next we thoroughly dust & vacuum the rug on both sides until all the dry soil is removed. It’s said that 80% of the cleaning process is in the dusting. If the dry soil isn’t removed first, the soil stays in the tight knots of the rug causing continued abrasion, breaking the fibers and prematurely wearing out the rug. Dyes are tested for stability and rugs that will bleed are treated to stabilize the dyes before the rug is washed. It is necessary that Rugs are washed with cold water and Neutral PH Wool Safe approved shampoo. High PH products and hot water are great when used to clean synthetic carpet but is too strong for natural fiber rugs and will cause damage. High PH and Pet Urine can also release the dyes causing the colors to bleed. We also clean Delicate Upholstery Fabrics, including Leather and Suede in the client’s home. At Magic Rug Cleaners we do all our own rug hand washing at our own shop in Palm Desert. We feel our business and work history and qualifications are the things that set us apart from most other cleaners. Quality Cleaning is Our Business, Our only Business.